As a graduate of the University of Pennsylvania, Dr. Jessica Meier brings a wealth of valuable experience to our office for the last 4 years. She is a kind, caring individual and an experienced and excellent dentist- a great combination to match the style and energy of Dr. Cirka’s dental practice. Her personality is surprisingly similar to his. Dr. Meier prides herself on treating patients as if they were part of her family. She is frequently told by patients that her kind and gentle demeanor helps them feel at ease. Her ability to skillfully handle all dental concerns in a calm environment only amplifies the care she provides. Whether seeing Dr. Meier for a routine check-up or a cosmetic dental procedure, you will feel comfortable in her care. 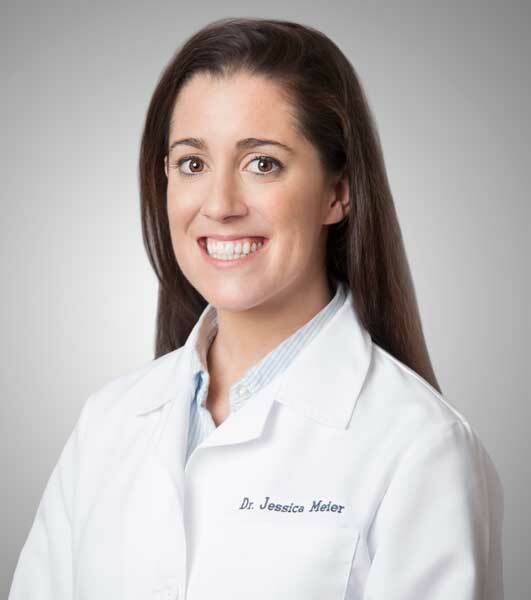 Dr. Jessica Meier grew up in Bergen County, NJ and completed her undergraduate work at Barnard College, Columbia University. There she earned her Bachelor’s degree in Neuroscience. After college Dr. Meier worked for Physiology and Medicine Nobel Laureate, Dr. Richard Axel. During this time she also pursued volunteer efforts at dental clinics in underserved communities of New York City, Nicaragua, and the Dominican Republic. She then went on to receive her dental degree from the University of Pennsylvania. Dr. Meier actively enrolls in continuing education courses to ensure that she is up to date with the latest advancements in all aspects of dentistry. She is also very active in the community and donates services for children and adults in underprivileged communities. Dr. Meier’s hobbies include traveling, spending time with loved ones, cooking with her husband Damian, and taking her Boston Terrier, Ponzu, to the dog park. She has an identical twin sister, Kristen, studying to be an orthopedic surgeon at Mount Sinai, NYC, and an older brother, Eric, teaching history in Harlem, NYC. She is supported by wonderful staff, friends, and family. She is an active member in the American Dental Association, the Academy of General Dentistry, the Pennsylvania Dental Association, Delta Sigma Delta dental fraternity, and the American Academy of Cosmetic Dentistry. Providing patients with excellent dental care that lasts a lifetime is my personal mission. I hold my job and duty as a dentist in the highest of standards and take it upon myself to explain to patients exactly the treatment that they require, whether it is to improve their overall health or improve their smile cosmetically. Being involved with patients on a more personal level always brings me happiness and makes my job more interesting and fun. Seeing patients regularly allows our relationship to grow and it is a pleasure hearing about their families, vacations, new career paths, and involvement in the community of Philadelphia. By interacting with other patients, I myself have grown as an individual and learned about different ways I can give back to the community both as a dentist and as an individual, enriching my life. Here in our office we will always see patients within a few minutes of their appointment time. We understand how important your schedule and time are and honor this agreement. I will never be in a hurry or a rush when discussing your treatment. This is an important part of my commitment to you. We will schedule more than sufficient time for the appointment in order to make sure that your questions and concerns are addressed. I will always give my answer honestly and treat my patients as I would treat any of my family and how I would want to be treated myself. The staff here fully supports this mission to provide excellent dental care. They are kind, friendly, and many have been here for close to 10 years. They are an integral reason as to how I can provide dental treatment that goes above and beyond expectations. They will answer your call on the first telephone ring, be flexible with your schedule, and get in you into the office ASAP in the event of a dental emergency. Both Dr. Cirka and I know and are firm believers that your oral health affects your overall health. Our goal is to help the community of Philadelphia be healthier and live longer lives. We consider our patients to be a part of our family and promise to be courteous, gentle, and make sure your visits are as enjoyable as possible.